The squirrels at Lehigh eat well. I took this photo on the way to a meeting, who wouldn’t want a photo of a squirrel with a french fry? 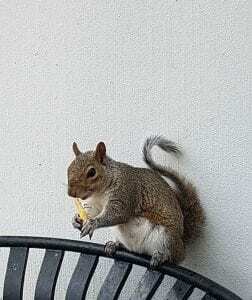 A colleague informed me that this same squirrel basically lives in the trash can (or near it), which is right outside the EWFM Library. I now see him dining out of this trash can all the time. Super cute. I believe this one is very cute. Thank you so much for you picture.